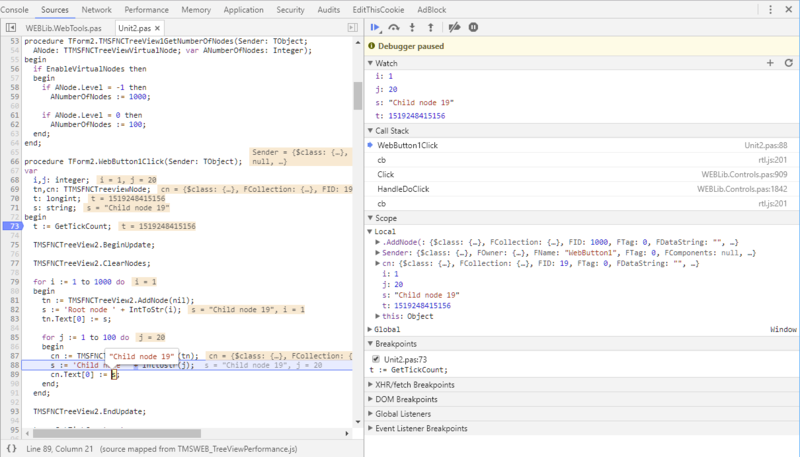 So, when you launch your web application in debug mode, with the help of an automatic generated map file, the Google browser debugger allows you to step through your original Pascal source code, inspect values, use watches, set breakpoints etc.. pretty much the same way as you would do from the Delphi IDE. So, all in all, this offers excellent debugging facilities for your web applications when using the Google Chrome browser or Mozilla Firefox browser. So, with TMS WEB Core, if you compile in debug mode, this extra map file is generated that allows you to debug from the browser in Pascal code and when you compile in release mode, this map file is not generated and your Pascal code is not visible to users. Get started today: Technical previews of TMS WEB Core, TMS FNC UI web-enabled controls, web-enabled TMS XData, the first parts under the TMS RADical WEB umbrella are exclusively available now for all active TMS-ALL-ACCESS customers. This blog post has received 8 comments. Very clever feature. I think we will soon be running out of superlatives so remembering my international commentating days for Horse Trials and other equestrian events one has to pace oneself so that the truly amazing performances (features) get the right level of superlative. Trouble here is that Bruno and his TMS Software Team are rolling out many amazing features and I can well imagine there are more just around the corner. Brilliant so far. Every day in hospital is an excitement right now! I can''t get this working. I can debug in JS, I can open the pas file and put a breakpoint in the Delphi code, but the Delphi code is not mapped back to the java script. I have tried adding a map file to the JS file. I am guessing there is some step I am missing. It would be good to get a step by step walkthrough of how to get Delphi code mapped to the JS. Note: I have been trying this with the "Simple" demo, and the Chrome browser. Turns out, If I open the file through the <ctrl>+p lookup it all works. It is also much simpler to get debug going. When I breakpoint on the second line of WebButton1Click I get the objects in the first line correctly (same behaviour as above), but the second line objects fail. On the third line WebMemo1 works, WebMemo1.Lines does not, neither does WebEdit1. What browser do you use? We mostly use Chrome here and haven''t seen such issues.